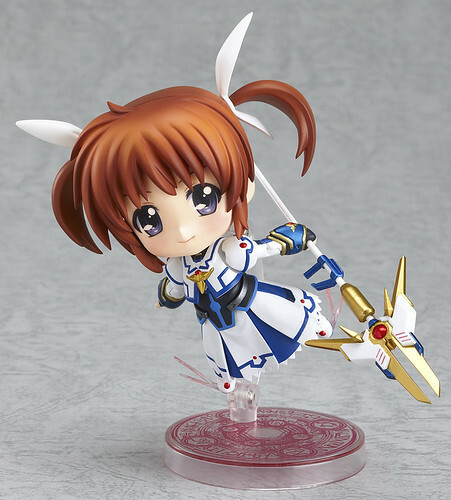 The fully-posable Nendoroid Takamachi Nanoha: Exelion Mode Edition from the recently-premiered movie Mahou Shoujo Lyrical Nanoha The MOVIE 2nd A’s has been available for pre-order starting today. Lyrical! Magical! Now fully posable! From the hit anime movie, Magical Girl Lyrical Nanoha The MOVIE 2nd A’s comes a fully posable Nendoroid of Nanoha Takamachi wearing her barrier jacket! She comes with three different expressions, including a standard expression, a shouting expression and a smiling expression. Her intelligent device ‘Raising Heart’ is included in Exelion Mode, plus you can also use the included parts to change it into Strike Flame Mode instead! The base of her stand is made to look like one of the magical circles from the show to add even more magic to the figure! She is scheduled for November release with a price tag of 4000 Yen. 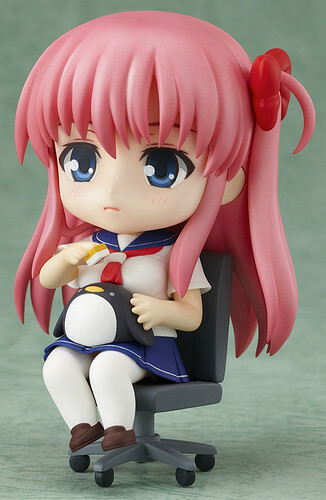 Nendoroid Haramura Nodoka from Saki: Achiga-hen episode of side-A is also available for pre-order starting today. From the anime series about girls who play mahjong, ‘Saki Achiga-hen episode of Side-A’ comes a Nendoroid of the popular Nodoka Haramura, also known as ‘Nodocchi’! You can display her with either the long hair that she used for national tournaments or instead with the twin-tails she used in regional matches! A variety of optional parts are also included, such as mahjong tiles and point bars as well as Nodoka’s beloved penguin plushie, Etopen! You can also pose her with the included spaced-out expression to recreate the “Nodocchi mode” that she enters while playing mahjong! A load of options that allow you to choose how you want to display her! She is scheduled for December release, priced at 3800 Yen. I guess there are many Monster Hunter fans craving for this fully-posable Nendoroid Hunter: Male Swordsman – Lagia X Edition from Monster Hunter Tri G.
The G-class armor set made from the Lord of the Seas! 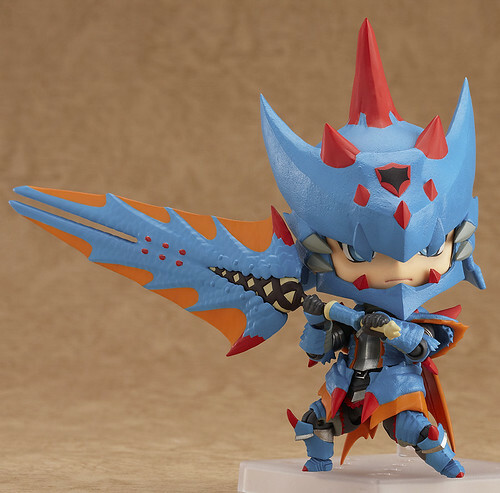 From the Nintendo 3DS exclusive game, ‘Monster Hunter Tri G’ comes a fully posable Nendoroid of the male swordsman wearing the G-class ‘Lagia X Series’ of armor that can only be made using materials from the powerful sea wyvern, Lagiacrus! The surface of his armor has been given a very solid finish to recreate the protective appearance of the armor, and in total he features an amazing 23 different joints for all sorts of different poses. His giant greatsword known as the ‘Lagia Blade’ can be posed in all the various ways you remember from the game, allowing you to play around to your heart’s content! He is going to be released on November with a price tag of 4000 Yen. 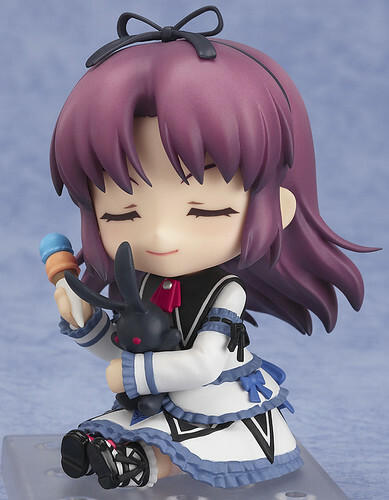 Being in the same boat with Nendoroid Hunter to be available for reservation since July 24 is Nendoroid Renne from Eiyuu Densetsu: Sora no Kiseki. The intelligent young girl who loves causing mischief! From the popular game ‘The Legend of Heroes: Trails in the Sky – Second Chapter’ comes a Nendoroid of Ouroboros Agent, Legion No. XV – Renne, also known by the name ‘The Angel of Extermination’. She comes with three expressions, including a cunning smile, an angry face to pose her in combat scenes and a cheeky, overconfident expression with closed eyes. She also comes with the scythe she uses for battle scenes, as well as her black bunny plushie and some ice-cream for more innocent, childish poses Be sure to display her with Nendoroid Estelle Bright to recreate your favorite scenes from the game in Nendoroid size! She is scheduled for November release, with a price tag of 3500 Yen. This entry was posted in News and tagged eiyuu densetsu, haramura nodoka, lagia x series, legend of heroes, mahou shoujo lyrical nanoha, monster hunter, nendoroid, renne, saki, sora no kiseki, trails in the sky.